I’ve been wanting to try this “onion pizza” since the day I saw it on The Cooking Ninja’s blog. 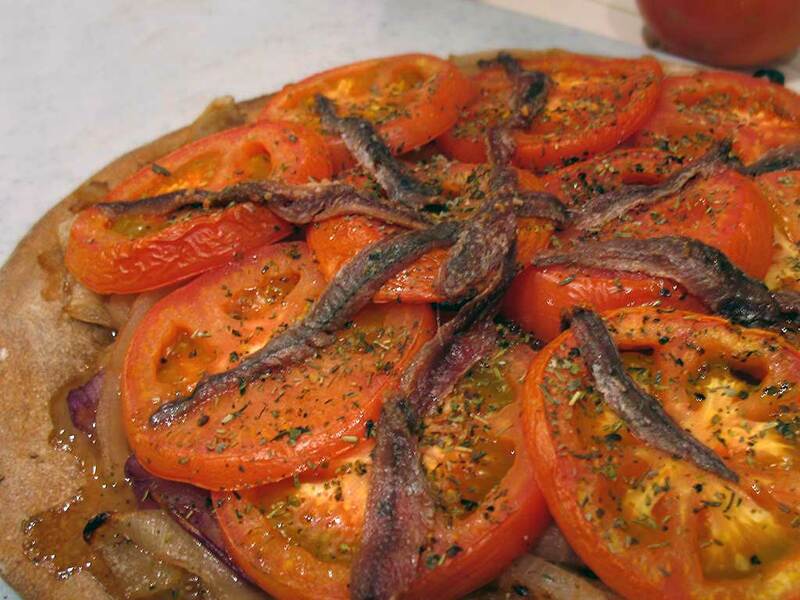 No sauce, no cheese, just a ton of caramelized onions, some herbs, tomatoes, and anchovies. Simple and amazingly tasty. We love onions, so I knew this would be a hit. Holy mackerel it smells good in here. Actually those are anchovies, and it should smell good — I caramelized four whole onions for this pizza! Yum! This is delicious — even with the anchovies! I thought you would like them; that’s some salty goodness. Why do your clothes smell like onions? Preheat the oven to 410F, or use the instructions on your pizza dough. Heat some oil in a pan over medium-high heat and sauté the onions until they start to turn golden brown; sprinkle with salt. On a floured board, roll out your dough into a 12-14″ circle, then move to a pizza pan or baking sheet. Lay the onions onto the dough, then layer with tomatoes, some herbs, and finally, the anchovies. 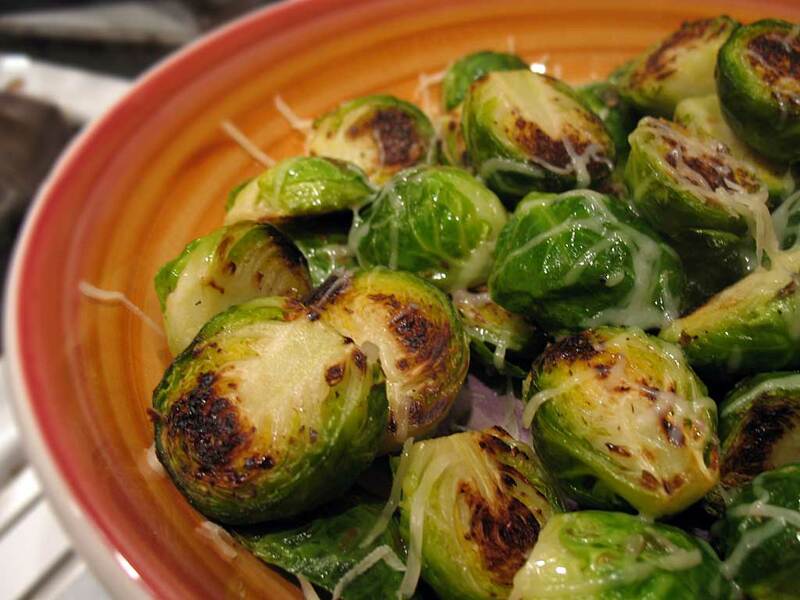 Cook for 25-30 minutes or until the crust is golden brown. 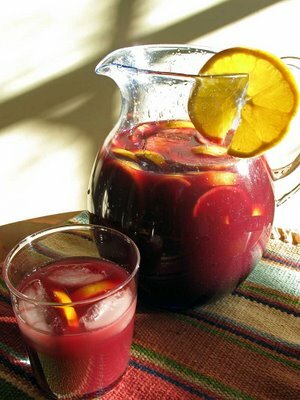 Hooray, an excuse to make Sangria — friends coming over for some early-afternoon eatin’ on Thanksgivin’! Hey, this hits the spot! More please. Wow, I love that picture you took! By the way, make sure people know I doubled the recipe shown below. Slice the fruit, then mash at the bottom with the sugar. Add the wine, orange juice, triple sec, and brandy, and chill. Serve over ice, and garnish with additional fruit. The first dish of the day for our Thanksgiving feast was Borani, a Persian spinach and yogurt dip. 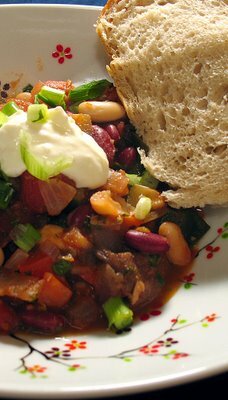 This recipe comes from The Moosewood Restaurant Cooks at Home cookbook. This is delicious! And even better after it’s been chilled. Yeah I really like this — next time we have people over I’ll have to make it again, but double the recipe. Hey, I’m thirsty. Good thing I made Sangria! After rinsing the spinach, cook for a few minutes over medium heat in a covered sauce pan until wilted but still bright green. 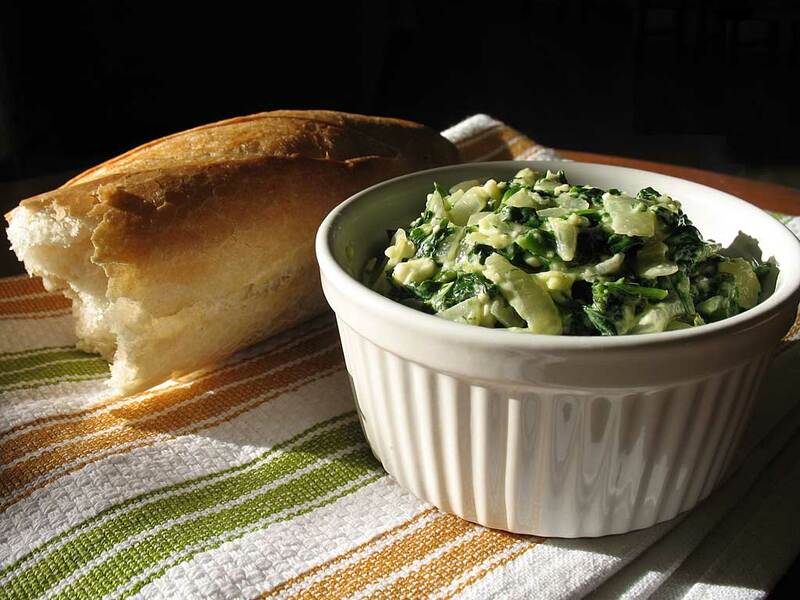 Drain the spinach and press in a colander or sieve to squeeze out the excess moisture. Saute the onions, scallions, and garlic in the olive oil. When the onions are soft and translucent, stir in the spinach and dill and heat for about 2 minutes. Use a slotted spoon to press out any extra liquid and transfer to a bowl. Stir in the feta and yogurt and add salt and pepper to taste. Chill for at least an hour. Serve with bread or pita. 1. Preheat oven to 350°F. Place the eggplant and mushrooms in a roasting pan and toss with a tablespoon of olive oil. Cover with foil and bake for 30 minutes, stirring once. Remove from oven. 2. Heat 2 tbsp olive oil on medium heat in a large saucepan. Add onions and cook for 4 minutes. Add garlic, cook for a minute more. Add zucchini, red bell peppers, and jalapeños. Cook 5 more minutes, stirring occasionally. 3. Coarsely chop the canned tomatoes, and add them to the pot, including their liquid. Add the wine, cumin oregano, fennel, and chili powder. Stir in the eggplant and simmer for 20 minutes over low heat. 4. Add beans, lemon zest, lemon juice, sugar, and cilantro. Add the salt and freshly ground pepper to taste. Simmer for 5 minutes. Serve with sour cream and top with chopped green onions. Get your beans on.